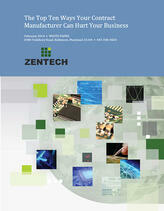 Choosing an electronic manufacturing services partner can be a risky proposition. There are literally hundreds of failure modes in the manufacturing process that can affect the reliability of your products. To help you choose the right contract manufacuturer from the start, we've created a guide outlining the 10 most common ways your contract manufacturer can hurt your business so you'll know what to look out for. Don’t let the wrong contract manufacturer ruin your business! Download the “The Top 10 Ways Your Contract Manufacturer Can Hurt Your Business” and learn what to look out for when choosing your electronic manufacturing services partner.